Baked Boneless Pork Chops in Tomato Sauce is a high-protein recipe you’ll find yourself making over and over again. These pork chops are juicy, tender, and full of flavor! These are truly the best oven baked pork chops I’ve ever tried! I might be a little biased because it’s a recipe from my childhood, but if you try them, I think you’ll agree. 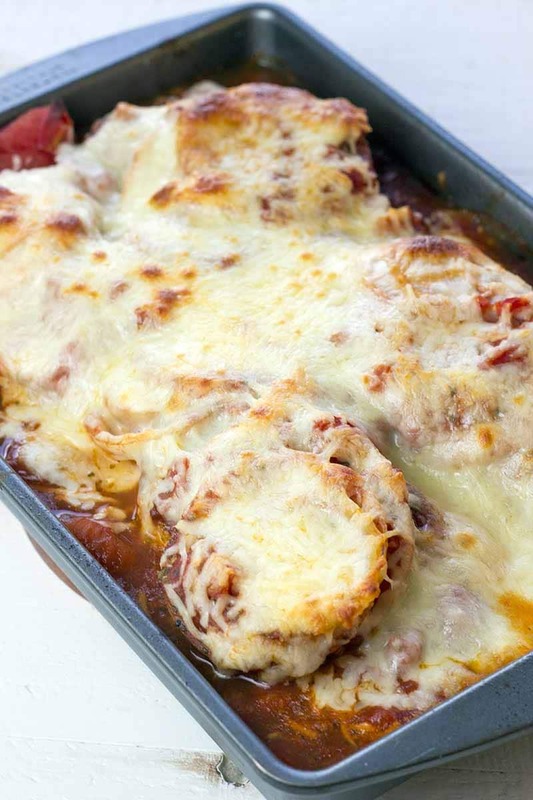 My mom would drown the pork chops in this rich tomato, onion, and cheese sauce and they were absolutely divine! She made them for me last time I was in Denmark to visit her and I just had to make them myself after I got home so I could share them with you. The best thing about this recipe is the cooking method ensures juicy, tender pork chops that are full of flavor. I don’t know about you, but I’ve had some bad baked boneless pork chops—they were tough, dry, and leathery. In other words, they were barely edible. Next, you place them in a deep baking pan while you simmer canned tomatoes with several other ingredients in the pan: onion, garlic, a chicken bouillon cube, and spices. This will become your tomato sauce. Once this combination is ready, you pour it over the seared pork chops. In this step, you’re smothering those pork chops with moisture to ensure they turn out juicy and tender. After you have covered the pork chops with tomato sauce, add low-fat mozzarella on top (because everything is better with cheese, right?) and bake for 20 minutes at 400 F.
Do you see now why I consider these the best oven baked pork chops I’ve ever tried? Every step of this recipe ensures the perfect pork chop! Even better, they have a great nutritional profile. Served alone without a side dish, each serving contains 405 calories, 17.1 grams of fat, 16.2 grams of carbs, and a whopping 43.5 grams of protein. 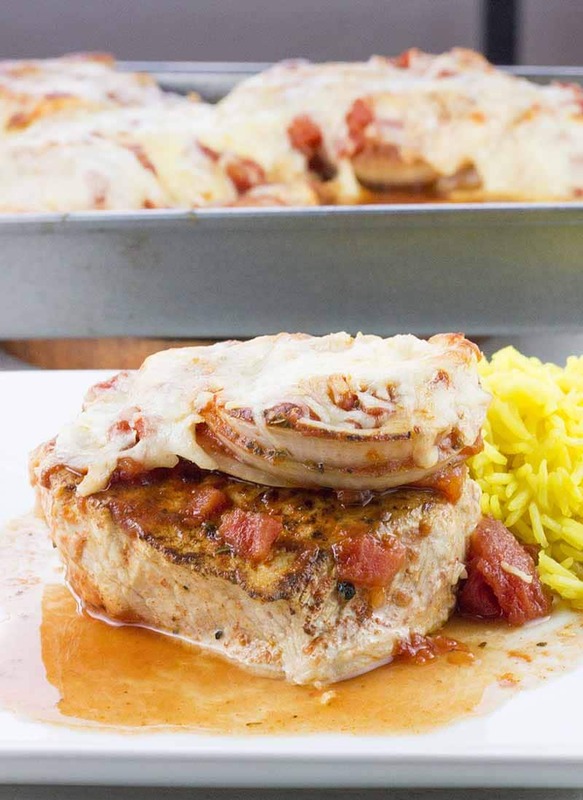 When you’ve tried this healthy Baked Boneless Pork Chops in Tomato Sauce recipe, please don’t forget to let me know how you liked it and rate the recipe in the comments below! Cut onions into rings. Peel and slice the garlic. Cut the fat rind off the pork chops (if needed). Coat a pan with cooking spray. Season pork chops with pepper and sear for about 2 minutes on each side (until light brown). Take the pork chops off the heat and place them in a deep baking pan. Add onion rings and garlic to the pan you used to sear the pork chops and sear for about a minute on each side. 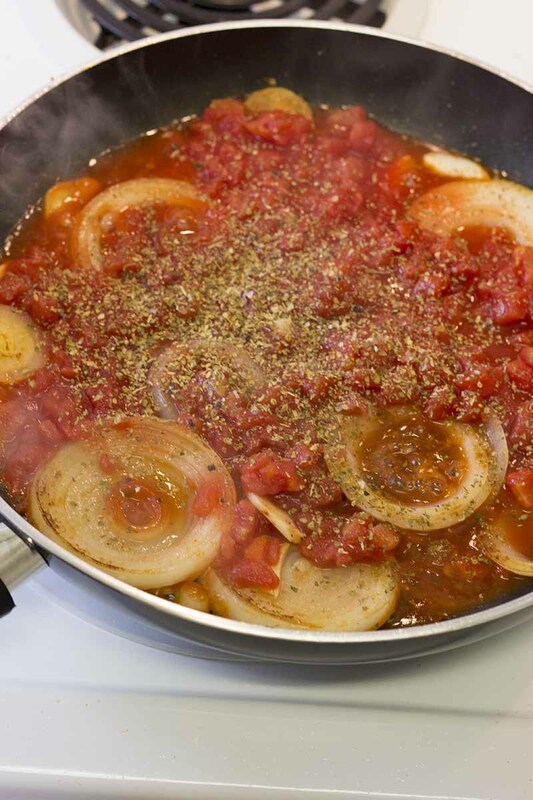 Add tomato, bouillon cube, and spices to the pan and mix it all together. Let it simmer for 2 minutes and then pour over the pork chops. Sprinkle cheese on top and bake for 20 minutes. 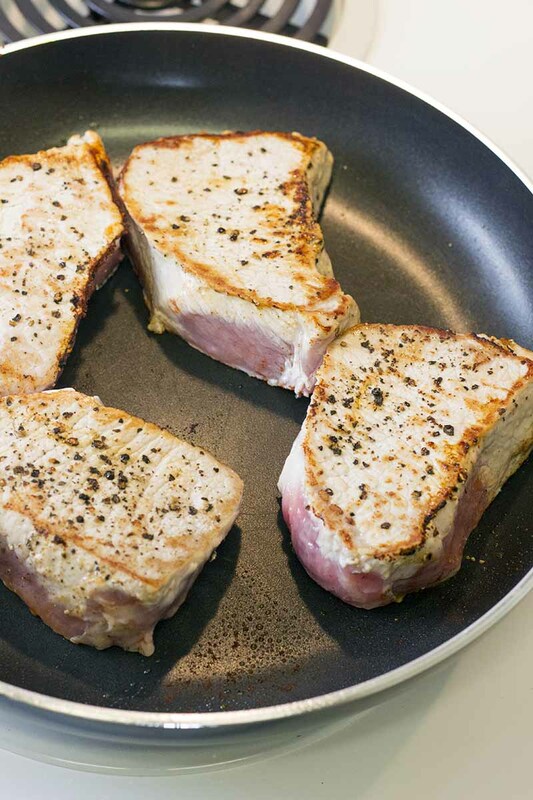 Take the pork chops out of the oven and let them rest in the pan for 5 minutes before serving. 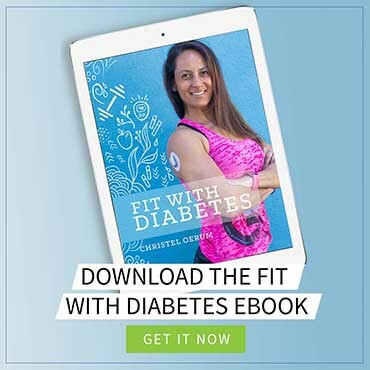 Previous Post: « Fasted Cardio and Diabetes: Friend or Foe? I just made this tonight and loved how delicious and flavorful it was – and how quickly it comes together. I did add some salt, pepper, paprika and garlic powder to the pork chops before searing just for some added flavor and the canned tomatoes I had on hand were fire roasted. I think they added a nice touch. Thanks for the recipe! I purchase thick centre cut pork chops from the butcher shop & set the oven temp @300 degrees for 90 min & the meat is so tender it melts in your mouth. I have made this recipe several times & just love it. 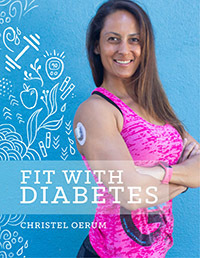 I love the Diabetes Strong recipe collection & search through it several times a week. Yes, you can definitely use fresh dished tomatoes, I actually prefer that however, it is more time-consuming. I would only add one teaspoon of the tomato puree/concentrate. What about stewed tomatoes as a sub for diced? I made this yesterday and it was wonderful. It will definitely be a recipe I make for my family often.